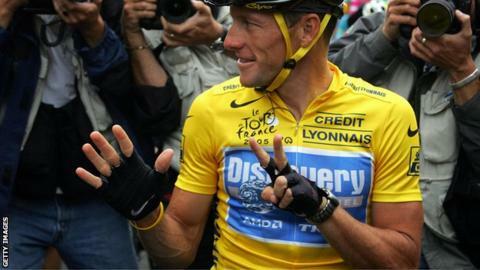 Lance Armstrong should have to repay his Tour de France winnings after being stripped of his seven titles, says race director Christian Prudhomme. The International Cycling Union after ratifying a US Anti-Doping Agency report on him. Tour director Prudhomme called the UCI's decision "totally logical". And he added: "The UCI rules are clear. When a rider is disqualified, he must pay the prize money back." It has been estimated that Armstrong won around £2.4m, some of which was shared with his US Postal team-mates, for winning the Tour de France in seven successive years from 1999 to 2005. Armstrong has deleted reference to his Tour de France wins on his Twitter biography. It had read: "Father of 5 amazing kids, 7-time Tour de France winner, full time cancer fighter, part time triathlete." Now it states: "Raising my 5 kids. Fighting Cancer. Swim, bike, run and golf whenever I can." The American has 3.78m followers on the social networking site. The UCI accepted the findings of the United States Anti-Doping Agency's (Usada) and called for Armstrong "to be forgotten". The UCI management committee will meet on Friday to discuss the "exact sporting consequences" of the decision, including whether the titles and prize money will be re-distributed, but Prudhomme repeated his wish that the results from the Armstrong years are not reallocated. "We hope that there is no winner in these editions," he said. "A formal decision must be taken by the UCI but for us, very clearly, there must be a blank record." Armstrong has also been to Texas insurance company SCA Promotions. The International Olympic Committee will await Friday's UCI meeting and further information before a decision is made on the bronze medal Armstrong won in the time trial at Sydney 2000. Armstrong overcame cancer to return to professional cycling. He has always denied doping but chose not to fight the charges filed against him. Usada released a 1,000-page report this month which included sworn testimony from 26 people, including 15 riders with knowledge of the US Postal Service Team and the doping activities of its members.